Since first hearing about him, I have always been fascinated by the life of the severely deformed John (mistakenly called Joseph) Merrick, also known as The Elephant Man. Victorian London is often portrayed as a sinister, cruel place in which to live but Merrick’s tale of struggle is probably one of the stories that affected me the most. I remember our history teacher at school making us watch David Lynch’s brilliant film to encourage us to be more ’empathetic’. I don’t know if it worked with some of my fellow classmates, most of whom were too busy throwing objects around the room or discussing the upcoming gig at the boys’ school over the road but it definitely made an impression on me. I remember literally bawling my eyes out by the end of the film and my teacher, concerned that it had had such an impact on me, quickly threw me over a box of tissues. 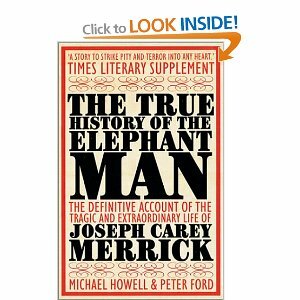 The film is great but in order to learn more about Merrick and more generally, Victorian attitudes to deformity, I would recommend reading ‘The True History of the Elephant Man’ by Michael Howell and Peter Ford. I’m not normally a non-fiction reader but this provided me with such a compelling account of Merrick’s life, I was hooked from the beginning. It also contains some amazing black and white photographs of Merrick, his family and some of the people he encountered along the way. Howell and Ford are keen to present an objective and impartial view of Dr Treves, who is often portrayed as the saviour to Merrick. While his determination and talents were integral to Merrick’s comparative peaceful later life, he was an interesting multi-layered character in his own right and I will probably read his account of his time with Merrick in the future.